Previous: ARE GIMP MASKS THE NEW MUST HAVE RAVER ACCESSORY? 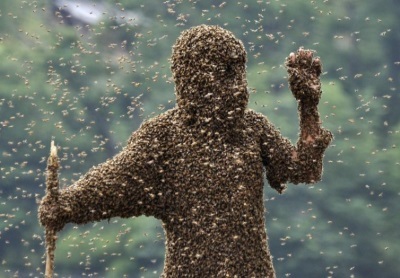 Local beekeeper Martin Reisley was arrested last weekend after he released a truck full of honeybees at an illegal outdoor rave. “Over four hundred partygoers had gathered on his land without permission, mistakenly believing it to be public property” says Sgt. Batista. “They were hoping to celebrate life, instead they got a taste of hell. Mr. Reisley could have called the police to disperse his unwanted guests, but he chose to take the law into his own hands. Canada is a nation base on the rule of law. There’s no place for vigilante justice within our borders.” The honeybee attack left hundreds of ravers hospitalized, and countless more traumatized.